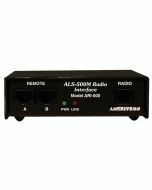 Ameritron's revolutionary ALS-600 is amateur radio's ONLY linear amplifier that uses four rugged TMOS RF power FETs -- gives unequaled no tune solid state performance. Includes Ameritron's no tune FET Amplifier and a 120/220 VAC, 50/60 Hz AC power supply for home operation. Over Power Protection -- if output forward power or reflected power exceeds safe level, output power is automatically reduced to prevent amplifier damage by controlling ALC to exciter. Extremely quiet -- low speed, low volume fan is so quiet you'll hardly know it's there, unlike noisy blowers used in other amps. Very Compact -- 6 x 9 1/2 x 12 inch amplifier takes up less desktop space than your transceiver and weighs 12 1/2 pounds. Operate/Standby Switch -- lets you run "barefoot", but you can instantly switch to full power if you need it. Front Panel ALC Control -- exclusive Ameritron feature -- convenient front panel control lets you adjust your output power. Transmit, ALC SWR LED indicators -- keeps you informed. 12 VDC output jack -- lets you power low current accessories. Separate ALS-600PS power supply (included) can be placed conveniently out of the way and plugged into your nearest 120 VAC outlet -- no special wiring needed. enjoy 600 Watts of no tune solid state power. Call your favorite dealer for your best price, order ALS-600 with power supply. 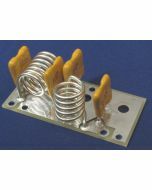 Massive choke input filter greatly improves voltage regulations nd reduces peak AC line current. Ameritron's exclusive Multi-Voltage Power Transformer lets you compensate for stressful high line voltage and performance robbing low line voltage. Step Start Inrush Protection stops damaging inrush currents and extends life of power supply components. Illuminated Cross-Needle Meter monitors voltage and current of 50 VDC line. Very Compact 6 x 9 1/2 x 12 inches -- can be placed conveniently out-of-way. Wired for 120 VAC, supplies 50 VDC at 25 amps to ALS-600 amplifier. Also use on 100-130 VAC and 220-250 VAC, 50/60 Hz. Draws less than 12 amps at 100 VAC and less than 6 amps at 230 VAC. Includes prewired cable to plugin to ALS-600 Amplifier.